A language of forms derived from the architecture of the modern urban environment is an integral part of the minimalist and architectonic aesthetic inherent in Morag Ballard’s recent paintings. Ballard trained as a sculptor in the early 1980s at Bath Academy of Art, where she used large interior spaces to create broadly conceived sculptural installations. In the years since, she has dedicated herself to painting, producing a body of work that references and merges with modernism. 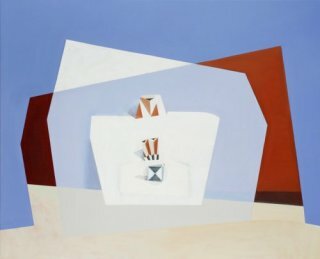 Her work has often felt as though it belonged to the early years of modern art – the world of artists using the constructivist modes of 1930s abstraction, although Ballard has also included forms derived from observable reality. 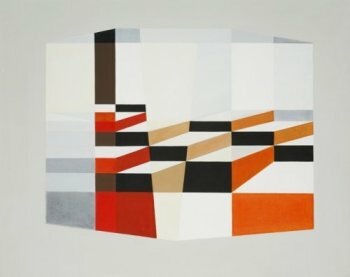 In this exhibition she has largely moved on from the landscape based inspirations that have preoccupied her in the past to develop a language of forms using an architectural vocabulary. These recent paintings simultaneously demonstrate a new boldness of vision together with an increased refinement of communication. 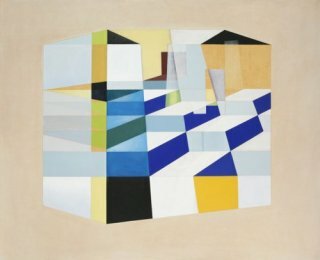 With her characteristic precision and lightness of touch, Ballard explores the possibilities of relationships between implied spaces using architectural forms. Planar and linear elements combine with advancing and receding manipulations of colour to create complex works that reveal an ambiguous three-dimensionality. These imaginary architectural spaces use formal elements which are juxtaposed and layered; sometimes creating curious illusions of other, fictional spaces. These dynamic yet intangible ‘constructions’ are enlivened with elements of classical geometric pattern which are meticulously wrought in a myriad of combinations. Ballard’s paintings have subtle yet distinctive characteristics, and reward prolonged and repeated consideration. Calm in their exterior presence – quiet, spare and luminous – her works also deliver a robust sculptural impact. Ballard takes a long time to make her paintings; she works slowly, making slight shifts, revisions and adjustments over a period of months in a process of contemplative and constant consideration. 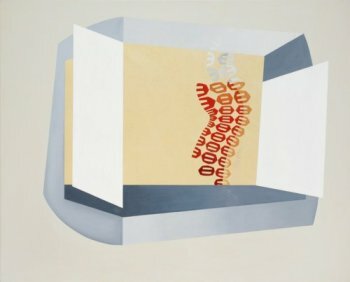 She has shown her work consistently at England & Co since 1991 – this is her seventh solo show at the gallery – and has produced a substantial body of paintings that have built her a discreet, but ever growing reputation.